In this research area I examine the implications of dynamic hydrological variability for irrigation and river basin management. The key paper is Lankford B. 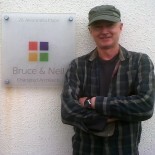 A. and Beale, T. (2007). Equilibrium and non-equilibrium theories of sustainable water resources management: dynamic river basin and irrigation behaviour in Tanzania. Global Environmental Change 17, (2), 168–180. (PDF). 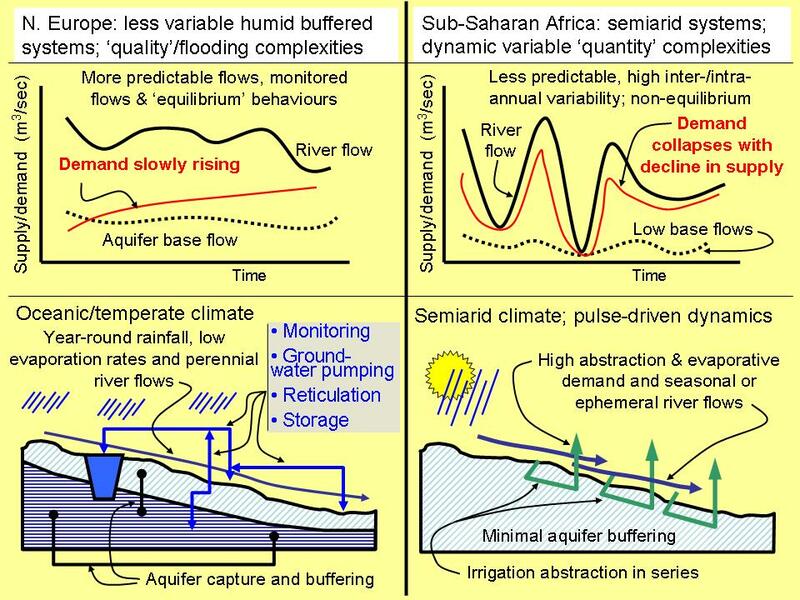 This paper, stemming from 5 years of funded research in southern Tanzania is notable for its contribution to the debate about small vs. large irrigation and applies ideas of non-equilibrium dynamics from rangelands science to theories of river basin management, and is therefore positioned to comment on adaptation for climate change. The paper was presented at the 2006 Stockholm Water Week at a workshop on Drought, Risk and Management for Agricultural Water, as a result of being invited by the Chair, Alok Sikka, after he saw a copy of the paper. I also believe it informs policy of irrigation growth in Africa, acknowledging that irrigation drives the behaviour of river basins in unforeseen and complex-to-manage ways. The theoretical and practical implications of river flow variability and unpredictability are then shown in two other papers. First, I show how irrigation design methodologies should be re-thought to determine headworks and main canal dimensions, in recognition that irrigation systems need to be placed in context within dynamic and multiple-sector river basins. The paper therefore challenges the existing orthodoxy in irrigation planning methodology, identifying the discourse around the engineering method which establishes a prior call on scarce water in competitive river basins. The key insight, from research in Tanzania, is that current planning methods are unable to promote sufficient flexibility in allocating water to match rapid change. See Lankford, B. A. (2004) Resource-centred thinking in river basins: should we revoke the crop water approach to irrigation planning? Agricultural Water Management 68:1 33-46 (PDF). Second, using a case study in Tanzania, I show how the headworks of irrigation intakes should be reconfigured to assist in the apportionment and allocation of river basin water for both upstream irrigation and downstream users. The paper explains that formal and informal rights might work alongside each other, yet promotes the idea that irrigation infrastructure defines and delimits negotiations over water rights. See: Lankford, B. A and Mwaruvanda, W. 2007. A legal-infrastructural framework for catchment apportionment. In ‘Community-based Water Law and Water Resource Management Reform in Developing Countries’. Barbara Van Koppen, Mark Giordano, and John Butterworth (eds). Comprehensive Assessment of Water Management in Agriculture Series, CABI Publishing. 228-247. (PDF). A good summary article of these ideas, and how they relate to the Cathedral and Bazaar IWRM critique is given here. Lankford, B.A., Tumbo, S. and Rajabu, K. 2009. Water competition, variability and river basin governance: A critical analysis of the Great Ruaha River, Tanzania. 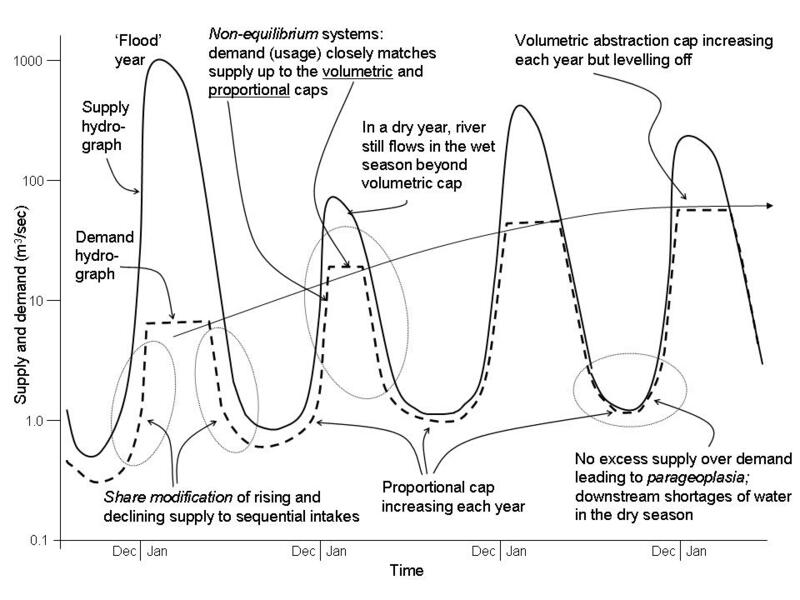 In; F. Molle and P. Wester (Editors) River Basin Development in Perspective, CABI. pp 171-195 (PDF). Also see the Hresearch theme.